The meet is very undersubscribed and it will therefore, be run over one session not two. 12:45 warm-up / cards posting for 1:30 start. Congratulations to Liz Griskova who has just returned from Lithuania having swum PBs in all her races in the Lithuanian National Championships (SC). She went 27.6? for the 50 free, 58.9? for 100 free, 2:08.?? for 200 free and 4:30.00 for 400 free. Note that tomorrow (Thursday 21 December) morning training (SENIORS and AGE GROUP only) is now 7am to 10am. 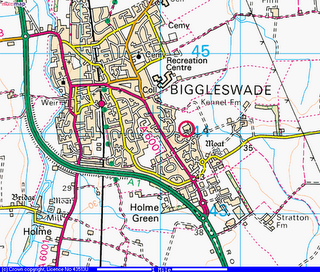 Drive north up the A1 to Biggleswade, turn right onto the A6001 (London Road). At what looks like the 2nd roundabout turn right onto Saxon Drive. Stay on this road (about 800m) until you see the pool on your left.